Did you know that starting your week with a chest session, is extremely beneficial. This is because your muscles are rested over the weekend, and the stimulation will encourage growth and strength. Also by starting your week with a chest superset, not only will you save time but you will boost your workout with high intensity. Supersets have been around for a long time. They have multiple benefits for an athlete, but there’s one issue that typically comes with them, that is they aren’t performed correctly. First, supersets can provide a metabolic benefit. When superset training you get a higher total energy expenditure. Another benefit to supersets is a benefit in power output, you can increase it by 4.7%. Every superset is composed of two movements: a push and a fly movement. You’ll also notice that the majority of times, the push and pull are rotated in the superset. This is to keep the muscles confused and in shock. When you start working out, you’re at the peak of your strength, but when you get tired you still need to keep your intensity and focus high. You won’t have any rest between the two exercises that make the superset, and you’ll have only a minute of rest between the supersets. Firstly, you will need to warm up, you will also need to focus. When you’re doing chest day, remember that you will also need to include your triceps, shoulders, elbows and pecs. Warm them up too so you can start to build muscle, you will need to make sure all of your muscles are ready, especially those you want to activate during the workout. Start your workout with incline exercises paired in a superset. Performing these exercises when you are most energetic and fully rested is extremely beneficial. Barbell presses go first because you’ll be able to handle more volume. 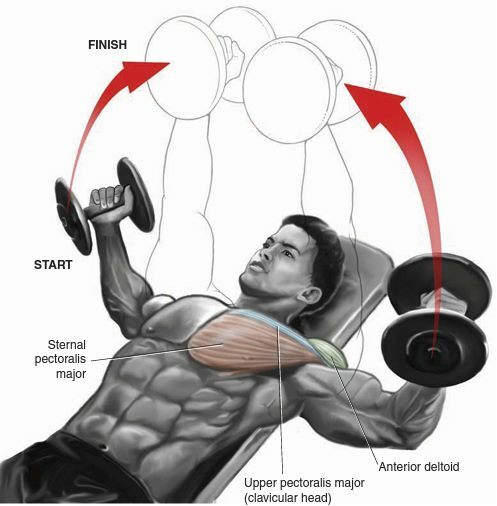 When you complete the presses, take a pair of dumbbells and do the incline flyes. As you do fewer and fewer repetitions, your weight should increase. Remember to adjust these numbers to keep yourself injury-free because when you train with more intensity like this, you might not always be strong enough to do them combined. Do three rounds of this superset with 10, 8 and 6 repetitions of each of the two exercises.